The response by Trudeau spoke to the Fourth Industrial Revolution, the theme of the Davos conference. He didn’t actually respond to the presumption on education. In 2012, about 53.6% of Canadians aged 15 and over had trade certificates, college diplomas and university degrees. This was an increase of 20.9 percentage points since 1990. … says “The Indicators of Well-Being in Canada (2016)“, by Employment and Social Development Canada. Between 1999 and 2009, the proportion of adults aged 25 to 64 with tertiary education in Canada increased from 39% to 50%. In 2009, Canada had the highest proportion of the adult population with tertiary education among all reporting member countries of the OECD. By comparison, the 2009 OECD average was 30%. … says Statistics Canada in “Educational Attainment and Employment: Canada in an International Context (February 2012)“. The origin of “much of the best work” is “done by amateurs” dates back to 1890 in photography. At that time, glass photographic plates was the norm for large images, as compared to the Kodak box camera released in 1888 with flexible roll film returned to the company for processing and reloading. Much of the best work one sees is done by so-called amateurs. In fact, good work can only be done by amateurs in the true sense; i.e., those who love their work, and the secret is thoroughness. One must be thoroughly interested in the work—make a thorough study of the subject, and have nerve enough to keep the holder out of the camera unless the light is satisfactory and the composition thoroughly good. The “you press the button and we do the work” method is often effective, but for plates of any size more often a waste than a gain. Very frequently we see picture makers who carefully read and observe the instructions sent by the makers with each box of plates, and the result is favorable. I envy them their pictures and the ability to stick to instructions, but I can’t do it myself. I confess to having little interest in a picture after the first batch of prints, or even after the negative has shown its quality—for the chemistry and other details of the subject exhaust most of my zeal. It has been my pleasure to incite some hundreds of persons to try the various branches of photography, pure and simple, while I have done some work in every branch from wet-plate to photo-engraving, and the criticisms here made apply equally to myself. I am a “hit or miss” portraitist, but am dead sure on some other branches said to be more difficult. Most people fail in their efforts in some direction, as is quite natural. Those who stick to one class of photographs usually make a success. Source: MacMurray, J.W. 1890. “Thoroughness.” In The American Annual of Photography, edited by C.W. Canfield, 4:38–40. New York, NY, USA: The Scovill & Adams Company. https://archive.org/stream/americanannualof04newy#page/n83/mode/2up. The 1890 author is fully identified as Major J.W. MacMurray, USA in the table of contents [p. v]. It is likely the same Major J.W. McMurray who was appointed as a Military Professor at the University of Missouri in 1872. The interest in photography might be associated with drawing in engineering in the U.S. Army at that time. 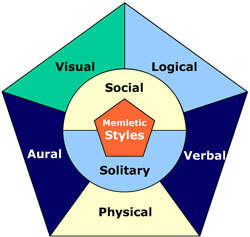 Sean Whiteley synthesized the Memletics (Learning) Styles from two brain models: Multiple Intelligences (from Howard Gardner) and the Visual-Auditory-Kinesthetic model (derived from sensory-based modes from NLP). The Memletics Learning Styles Questionnaire on http://learning-styles-online.com is cited as created in 2004, based on the Memletics Accelerated Learning Manual, by Sean Whiteley (Advanogy, 2003). With neither memletics.com nor advanogy.com domains currently online, the ebook has been reproduced on scribd.com by Maria McConkey. Whiteley bases his model on “brain regions”. Visual. You prefer using pictures, images, and spatial understanding. Aural. You prefer using sound and music. Verbal. You prefer using words, both in speech and writing. Physical. You prefer using your body, hands and sense of touch. Logical. You prefer using logic, reasoning and systems. Social. You prefer to learn in groups or with other people. Solitary. You prefer to work alone and use self-study. Lastly, we look at how you can improve your learning by using learning styles. One obvious way is to use more of your dominant learning styles. An interesting feature of learning styles is that you can also improve your learning performance by using styles you do not often use. If you are a mainly visual person, then you can make a lesson more memorable by using some aural content in your visualizations. If you like to use logic, then use some physical learning techniques occasionally. Visual. The occipital lobes at the back of the brain manage the visual sense. Both the occipital and parietal lobes manage spatial orientation. Aural. The temporal lobes handle aural content. The right temporal lobe is especially important for music. Verbal. The temporal and frontal lobes, especially two specialized areas called Broca’s and Wernicke’s areas (in the left hemisphere of these two lobes). Physical. The cerebellum and the motor cortex (at the back of the frontal lobe) handle much of our physical movement. Logical. The parietal lobes, especially the left side, drive our logical thinking. Social. The frontal and temporal lobes handle much of our social activities. The limbic system (not shown apart from the hippocampus) also influences both the social and solitary styles. The limbic system has a lot to do with emotions, moods and aggression. Solitary. The frontal and parietal lobes, and the limbic system, are also active with this style. I’ve based the Memletic Styles on two brain models you may have heard about. The first is “Multiple Intelligences” by Howard Gardner. I’ve broadened his model and made it more applicable to learning. You may know the other model as “VAK,” or the Visual-Auditory-Kinesthetic model. Neuro-Linguistic Programming (NLP) books also describe this model as “modality preferences”. Source: Sean Whiteley, Memletics Accelerated Learning Manual (2003), pp. 55-56. As much as I would like to follow up on continuing research, the last mention that I can find about Memletics is a cached version on archive.org from 2008. My learning styles inventory as assessed from http://learning-styles-online.com sees my highest scores as logical and solitary. However, a closer interpretation says (i) logical, aural and verbal dominate over visual (slightly) and physical (completely), and (ii) solitary is preferred (but may not dominate) over social. If I am to have a learning style that includes listening and talking, I would expect that to happen socially!